This beautiful 10ct yellow gold trinity pendant is made in Ireland. 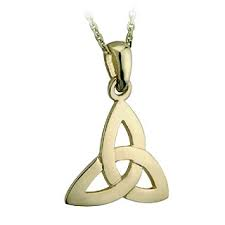 This beautiful trinity pendant is 10ct yellow gold & made in Ireland. Please feel free to call or email one of our friendly staff for further information and personalised service. While we aim to keep this pendant in stock item can be ordered with a 10 day lead time.